How much does it cost to open an account? Are there any monthly fees? The 91 Express Lanes does not have an actual “cost” associated with it at the time of opening. You are required to make a pre-paid toll deposit for each transponder ($40 for credit card accounts and $50 for cash accounts). If you are not providing a credit card, a transponder deposit of $35 per transponder is required. The prepaid-toll deposit is used to pay your tolls. Any unused pre-paid tolls and transponder deposits in your account at the time of account closure will be refunded to you. Three account plans are available. Please review the account plans for any associated monthly fees and one-time account fees. Our plan calculator will help you determine which account plan is most economical for you. To find out more about our account plans, click here. We will send your transponder via USPS mail to the address listed on your application within two business days of your account opening. Customers who open their account online report that they generally receive their transponder within 3 to 5 business days. You can view your current account balance by logging into your account and clicking on the Account Summary page. Toll transactions are viewable 24/7. Standard and Convenience Plan customers receive a customer statement each quarter with account activity and the remaining pre-paid balance. Express Club Members receive monthly statements. Please include your account number when providing payment by mail. The easiest way to update your contact information, vehicle information or billing information is by logging into your account. Keeping your account information current helps us provide you with excellent customer service. What happens if I don’t keep my credit card current? 91 Express Lanes accounts are pre-paid accounts. If you set up your account with a credit card, your credit card will be charged each time your account requires additional funds. If your credit card declines or expires, we will be unable to replenish your pre-paid account balance. Your account may become ineligible for toll charges. Transactions will be processed as toll evasion violations, which are subject to penalties and collection action as required by law. What if I get a new vehicle or get rid of a vehicle? Keep the vehicle information on your account current by adding or deleting information when your vehicle changes. The vehicle information on your account serves as a back up to your transponder should it not register. Tolls incurred by vehicles registered to your account will be deducted from your pre-paid toll balance. If you do not keep your vehicle information current, you could receive charges incurred by a new owner or be issued toll evasion violation notices if we do not associate a vehicle with your account. Log into your account to update your vehicle information. For temporary vehicle additions, you have the option to provide an end date at the time of addition. Log into your account to update your vehicle information by adding the license plate of the rental car. You can provide an end date and time for the rental period. Next, simply mount your transponder in the rental vehicle. These steps are important because if the plate is not listed on your account and the transponder is not read, the transaction will be processed as a toll evasion violation, which may result in penalties by the 91 Express Lanes and/or the rental company. Current contact information (address, email, phone) allows us to contact you with information about your account. Your email address will be used to provide account statements and automatic notices related to your account, including but not limited to notice of impending expiration of your credit card, notice of underpayment of a cash account, and/or notice of impending account closure due to under or non-payment. Please note that notices of toll evasion violation are sent to the street address on file with the DMV, which may be different than your account address. Why is a transponder required? The 91 Express Lanes operates with a state-of-the-art electronic toll collection system which requires a FasTrak® transponder. This transponder-based system allows travel at free flow speeds without stopping to pay a toll. To use the 91 Express Lanes, vehicles must have a properly mounted FasTrak® transponder associated with a pre-paid account. The adjacent Orange County Toll Roads offer toll payment by license plate in addition to FasTrak® transponder payment. The Orange County Toll Roads are separately owned and operated and the license-plate based Express Accounts and One-Time-Toll payment options offered by the Toll Roads are not accepted on the 91 Express Lanes. Failure to have a properly mounted transponder while travelling on the 91 Express Lanes is a violation of the California Vehicle Code and may result in the issuance of a toll evasion violation notice or citation by the California Highway Patrol. To view how to properly mount your transponder, click here. Do I need a transponder for each of my vehicles? Yes. Each vehicle travelling on the Express Lanes is required to have a properly mounted transponder. If you would like an additional transponder, you may request one by logging into your account. If you have an occasional use for a transponder in an additional vehicle, it is highly recommended that you add the plate to your account and obtain an additional set of adhesive strips so you can mount the transponder in the additional vehicle prior to the time of travel. Do I need a switchable transponder? No. You do not need a switchable transponder to travel on the 91 Express Lanes or to receive the 3+ carpool discount. If you plan to travel on the Los Angeles Metro Express Lanes or Express Lanes in the Bay Area and wish to receive a discount for carpooling, you will need a switchable transponder. Please contact the 91 Express Lanes customer service at (800) 600-9191 for a switchable transponder. Where can I use my transponder? 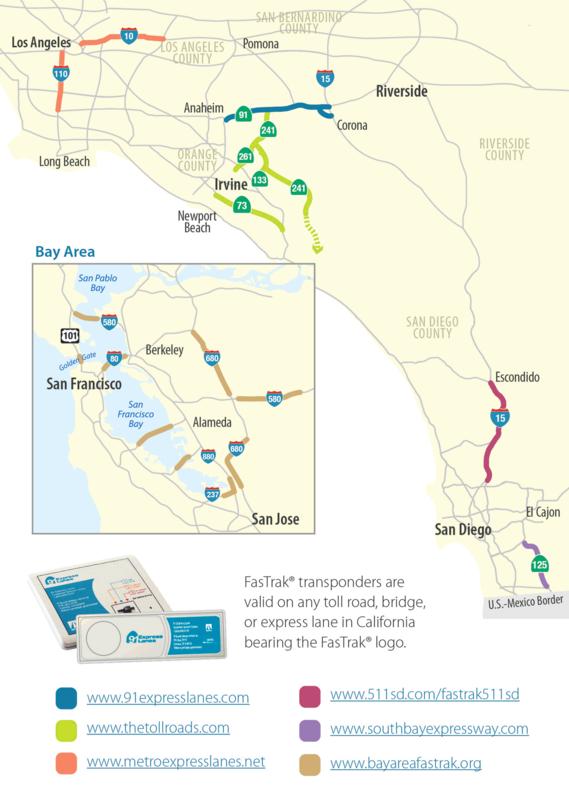 You can use your 91 Express Lanes FasTrak® transponder on any toll facility in California. The 91 Express Lanes exchanges information with the other toll operators within the state to provide you with seamless travel with a single account. Please note that the 91 Express Lanes issues a standard transponder, which is valid on all facilities. If you wish to receive a carpool discount on an Express Lane other than the 91 Express Lanes, you may require a switchable transponder. Simply call the 91 Express Lanes customer service center at (800) 600-9191 to request a switchable transponder. To view a map and websites of all California toll facilities and information regarding their toll rates and policies, click here. What if I need more adhesive strips? If you need additional adhesive strips, please email us at customerservice@91expresslanes.com or contact customer service at (800) 600-9191. Notify us immediately. Your only liability is your transponder deposit and any tolls charged to your account prior to your notification to us. How do I replace the transponder battery? Some transponders issued by the 91 Express Lanes have a replaceable battery. If you do not hear your transponder beeping when you pass through a toll point, the battery may need to be replaced. If you have a replaceable battery transponder, the transponder has a battery test button that will assist you in determining if a new battery is needed. The transponder requires a single CR2450. For a replacement battery, contact the customer service center at (800) 600-9191. For detailed instructions on how to replace your transponder battery, click here. If your transponder does not have a replaceable battery, please contact customer service at (800) 600-9191 for a replacement transponder. Tolls on the 91 Express Lanes vary depending on the day, time of day, and direction of travel. As you approach the entrance to the 91 Express Lanes, you’ll see electronic overhead signs that display the current toll amount for each destination. There are two toll points on the 91 Express Lanes: one in Orange County and one in Riverside County. The overhead signs will indicate the total toll amount for your chosen destination. Toll rate schedules are available online to plan your travels. Is there a discount for carpooling? Account holders with three or more people in their vehicle travel toll-free except eastbound, Monday through Friday from 4 to 6 p.m. During this peak time, carpools of three or more receive a 50% discount on the posted toll. All vehicles must drive under the designated 3+ Carpool lane at both the Orange and Riverside county toll locations to receive the discount. Is there a discount for a motorcycle? Is there a discount for clean air vehicles? If you drive a pure zero-emission vehicle (100% battery electric or hydrogen fuel cell), you may be eligible for a Special Access Account. Special Access Accounts are available for 91 Express Lanes customers who always drive with three or more people in their vehicle, drive a motorcycle, a pure zero-emission vehicle as certified by the California Air Resources Board, or have a disabled veteran or disabled person license plate issued by the DMV. If you think you qualify, go to www.arb.ca.gov/msprog/carpool/carpool.htm for list of qualifying vehicles that have an exhaust standard of ZEV. Where can I enter and exit the Express Lanes? There are three entry and exit points in each direction. Click here for a map displaying more information about entering and exiting the Express Lanes. Enter at the SR-55/SR-91 Interchange and the County Line. Exit at the County Line, SR-91 at McKinley or I-15 South at Ontario Avenue. Enter at I-15 North at Ontario Avenue, SR-91 at McKinley or the County Line. Exit at the County Line or SR-55/SR-91 Interchange. Which toll price sign shows my toll? Approximately a quarter of a mile prior to each entry point, an overhead price sign displays the price for each possible trip. When entering from the SR-55 North/SR-91 East Interchange or the SR-91 West/I-15 North, the price sign will display three prices. The first is the price for traveling to the County Line, and the second and third (eastbound only) are the prices for traveling both the Orange County and Riverside County segments. When entering from the SR-55 North/SR-91 East or SR-91 West/I-15 North, you will see a second price sign as you approach the County Line exit. The second price sign is for customers entering the Express Lanes at the County Line only. Your price is set based on the time you entered the lanes and will not change if you are in the Express Lanes during a price change. Where is the County Line? The Orange/Riverside County Line is the mid-point of entry or exit from the 91 Express Lanes. The County Line entry and exit point is approximately two miles prior to the Green River exit when travelling east and the 241 Toll Road when travelling west. You can enter or exit the Express Lanes at the County Line. Click here to see a map of the Express Lanes and the County Line. Exit the County Line at the first set of broken white stripes. Enter the County Line at the second set of broken white stripes. Where do I pay the toll? Your toll is paid automatically. The toll system calculates your toll based on the time you entered the lanes and the segments travelled and is deducted from your account prepaid toll balance automatically. Both the Orange and Riverside county segments have a toll point approximately midway through the segment. Your transponder will register at each segment. There is no place to stop and pay cash on the 91 Express Lanes. What is the difference between Entry Time and Toll Point Time on my statement? Entry Time is when you first entered the Express Lanes. It is used to determine the price that was displayed on the toll price sign and the price you are charged. Toll Point Time is when you cross each toll point in Orange County or Riverside County. How do you know if I am carpooling? When you have three or more occupants, you are required to drive through the HOV3+ lane at each toll point to receive the carpool discount. When you pass through the toll point, 91 Express Lanes staff and California Highway Patrol are on site to visually verify that your vehicle meets the 3+ requirement. Failure to comply with the carpool requirement could result in a citation from the CHP. Can large trucks or vehicles towing trailers use the Express Lanes? Unfortunately, no. The only oversized vehicles allowed on the 91 Express Lanes are motor homes and buses. Large trucks may not use the 91 Express Lanes for several reasons: (1) Caltrans has approved a maximum vehicle weight of 10,000 pounds for the 91 Express Lanes; (2) under California law, a variety of vehicles, including vehicles towing a trailer, and trucks with more than two axles, may only use the right two lanes of a four-lane limited-access highway such as the SR-91 freeway. Therefore, these vehicles may not use the 91 Express Lanes because there are only two lanes, and; (3) most larger trucks using the SR-91 freeway must stop at one of the weigh stations located near Weir Canyon Road, which is not accessible from the 91 Express Lanes. Therefore, trucks required to stop may not use the 91 Express Lanes. As with larger trucks, California law limits vehicles towing trailers to the right two lanes of a four-lane limited-access highway such as the SR-91 freeway. Therefore, vehicles towing trailers may not use the 91 Express Lanes. What if my car breaks down while I am in the Express Lanes? Our first priority is your safety. We have free tow truck services available to assist you during most hours of operation. The Express Lanes tow trucks are clearly marked with “Express Lanes.” Our traffic management center keeps a close eye on the Express Lanes and dispatches help within minutes. If you experience car trouble, pull as far left as possible and turn on your emergency flashers. If possible, move to an area where there is a widened shoulder. Call 911 and inform them of your issue and location. Our tow truck operators are trained to provide either fuel or a tire change, if the conditions are safe. If the tow truck operator determines that the safest action is to tow your vehicle, you and your vehicle will be taken to a safe California Highway drop-off location. From the drop-off location, you can contact a private tow company. Why isn’t there a direct connection to the I-15 North from the Express Lanes? Funding for both direct connectors from the 91 Express Lanes to the I-15 was unavailable. The I-15 south connector was determined to be more important as it will provide more traffic relief than the northbound direct connector. There are plans to build a direct connector from the 91 Express Lanes to the I-15 North once funding becomes available.